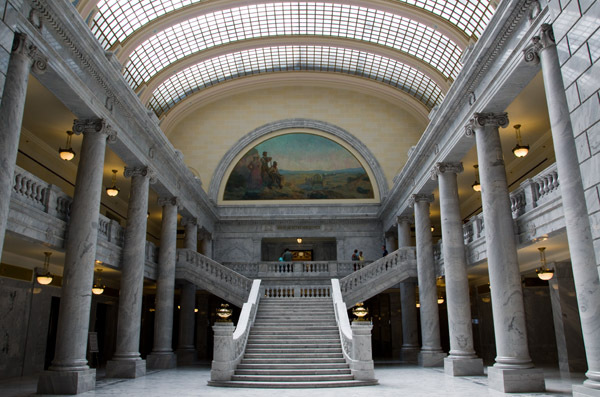 The U.S. may not have Europe’s 17th century palaces to house our government offices but we’ve still managed to create some amazing spaces for our bureaucrats. Each state capitol we’ve visited (18 in all so far) is unique. 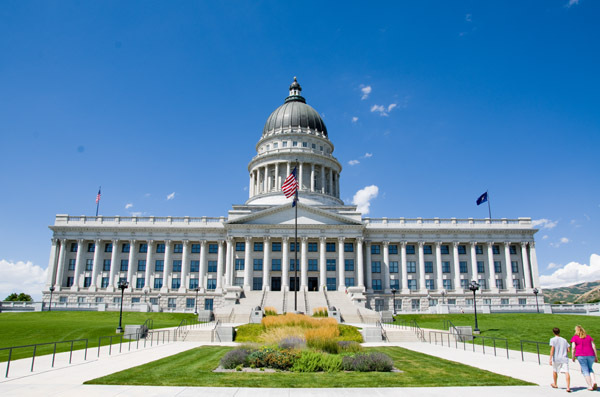 Notwithstanding its stereotypically domed neoclassical architecture, the Capitol in Salt Lake City is one of the most impressive we’ve seen. 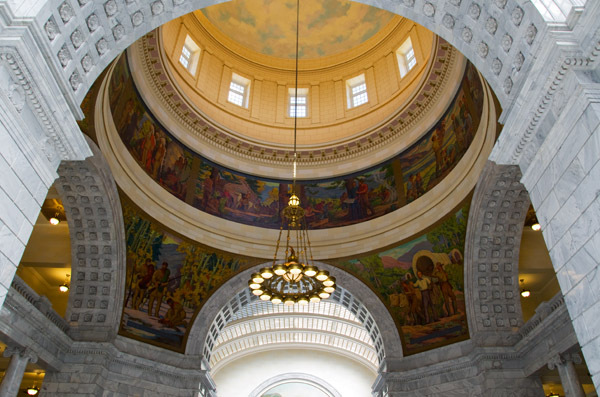 Its thee-story rotunda rises 165 feet above the ground, reaching its apex with an illusion of open sky. 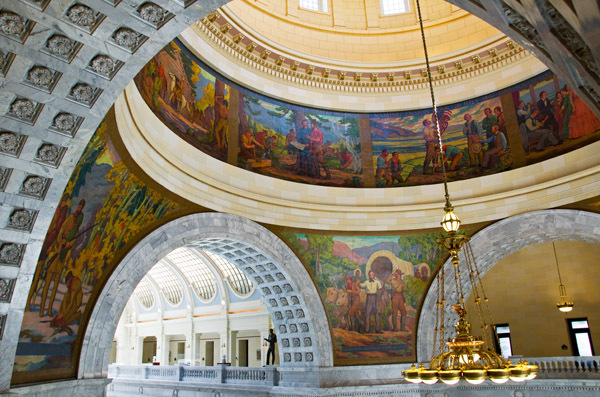 Colorful murals depicting Utah’s history warm the cold marble façade in a way we haven’t seen elsewhere. This combination of vibrancy and classical sobriety makes the huge open space both awe inspiring and intimate. Atriums flank the rotunda on its east and west. Large skylights supported by monolithic columns fill the open area with natural light and illuminate grand marble staircases. Outside, the Capitol rests on a 40 acre plot with gardens, a reflecting pool and a war memorial. It looks exactly like a capitol should, and most do. Inside, it’s something else entirely. beautiful! thanks for sharing such lovely pics. I lived just across the park from the Capitol for almost 10 years. I only visited it once, when I voted. They spent so long renovating it for earthquake safety. These are stunning photos. Thank you so much for sharing! One thing I didn’t mention is that the entire building rests on giant shock absorbers to protect it from earthquakes. Pretty amazing, especially since it wasn’t originally built that way. Thanks for reminding us that we do indeed have beautiful architecture here in the U.S. And as a matter of pride, I must tell you about Hawaii’s state capital building, which is quite unique and appropriate. It’s designed to resemble a volcano, a volcanic island in the sea (reflecting pools). Very interesting. We hope to be in Hawaii this winter and we’ll definitely want to cross its capitol off our list. Wow. I can’t believe that I never went inside of it on the couple of times I’ve spent time in SLC. If I ever move back to the Boise area, I will have to put it back on my must-see list. It’s definitely worth a stop and doesn’t take much time at all. Beautiful! Since you have visited (and I would guess photographed as well) a number of Capitol buildings, are there any plans to bring photos of all of them together in one blog post? I would love to see that! A year later, it may be time to do an update. Thanks for the suggestion.